The first time I ever did get the opportunity to taste cask samples of a closed distiller before anyone else. These two samples are subject to a tasting for the Casqueteers tomorrow. During that tasting there will be decided if they buy one of the casks. Before I start I want to thank Adri for let me taste them before anyone else did! The subjects are cask 32 and cask 34, both distilled 20 December 1990, matured on Hogsheads and both cask strength. Not bottled yet. It will be the first time for me to taste two sister cask filled with whisky distilled on the same day. Nice lesson in wood influence also. Seemingly no difference in colour to be detected. Nose: Outgoing nose, buttery, glue-ish (as in An old grain whisky) at first with a slight hint of cereals. Changing rapidly to lots of fruits. Getting vanilla, peach, pear and citrus notes. Also some oak notes and a slight hint of sweet smoke. Develops nicely with every time more to discover. Getting some pineapple and juniper now. Bourbon like style with a bite. Taste: Fierce taste for a lowlander. Oily and lots of pepper and a bit of cinnamon. A bit oaky and fruit cereal like. Bit dried banana, with fresh ripe peach, grapefruit and some bitterness. Mouthcoating waxy but alcoholic. Finish: Lots of bitter woody aftertaste, mid long. A bit nuttiness. Still that peppery bite when you swallow. Nose: Much more restricted then cask 34. Soft and gentle vanilla, citrus combined with honey melon and some golden kiwis. Needs time. Also again a bit glue-ish. Fresh, vibrant but a bit playful shyness. After some time hints of fresh sawdust, hay and a bit farmy (no animal farm though). Taste : Gentle sweetness no problem, easy to play around in your mouth. Crème Brule. More fruits as in green banana, kiwi and melon. Honey delight! Finish : Very pleasant mouth coating waxy, lemon with hints of oak and slightly toasted nuts. A very little touch of fleur de sel. A more balanced bitterness (woodiness) with cardamom and a tiny tiny bit of cloves. Conclusion : Much more restrained, but very playfull. More a lowlander type of style for me than cask 34. Extremly enjoyable. Two casks filled with spirit distilled on the same day, but boy what a difference between them. The fierce outgoing but a bit hefty cask 34 opposed to the more shy but more balanced and enjoyable cask 32. Yesterday I smelled them both before tasting and I had a preference for cask 34 but now my preference has undergone a severe change in favour of cask 32. Points for cask 34 : 84 and for cask 32 : 88. 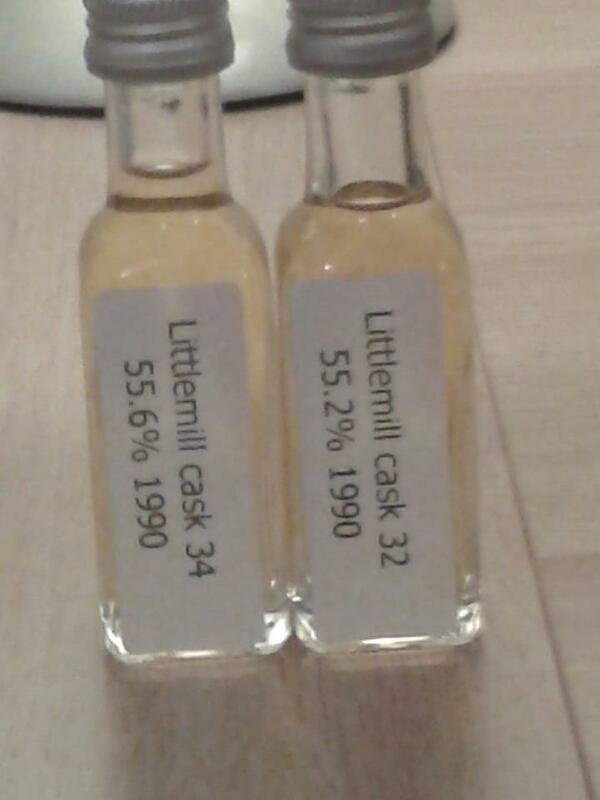 This entry was posted in Littlemill, Lowland notes and tagged 20 December 1990, cask 32, cask 34, Cask Strength, Closed Distiller, Littlemill, Littlemill 1990, Littlemill cask 32 1990, Littlemill cask 34 1990, Littlemill review, Littlemill tasting note, Lowland, Lowland whisky, whisky, whisky review. Bookmark the permalink.